Ultra-white, self-grouting powder adhesive, particularly suitable for laying vitreous mosaic. - Fixing vitreous mosaic outdoors, indoors and in swimming pools, on walls and floors. - To fix vitreous mosaic on net backing in swimming pools, dilute TC-LAX with water in 1:1 ratio. 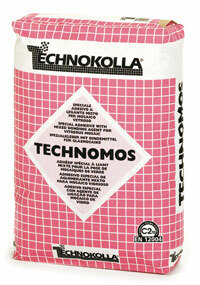 Blend TECHNOMOS with obtained mixture. The resulting product provides an extremely tenacious bond and is highly flexible while maintaining the creamy consistency obtained when only water is used for mixing. - Fixing ceramic tiles of all types outdoors and indoors on walls and floors. - Suitable for use when high performance is required, such as: on top of old ceramic tiles indoors, in swimming pools or on façades. - Fixing on water heating screeds. Cement-based plaster, cement-lime mortar, gypsum-based plaster¹, anhydrite screeds¹, cement-based screeds, concrete, aerated concrete, old ceramic floors, old linoleum floors², PVC² or vinyl², plasterboard, RASOLASTIK range and RASOGUM.